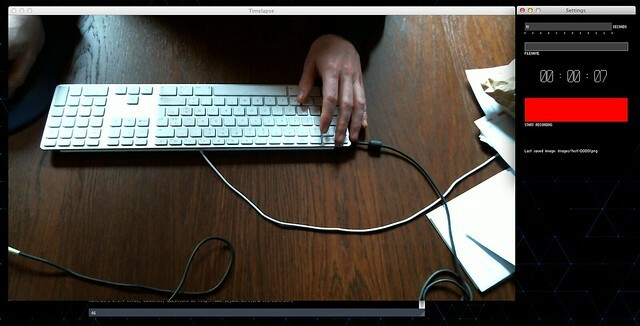 I needed a lightweight application to make time lapse movies with my webcam. This application was made with Processing (http://processing.org/) and uses the controlP5 (http://www.sojamo.de/libraries/controlP5/) library. The slider sets the number of seconds between each photo. The text field sets the file name of the images the sketch saves. Files will be saved in a directory named images. Structure of the file name is yourtexthere-00001.png. Click the button to start/pause saving images.